Ultrasound inspection of complex geometry and/or difficult access components can be performed with phased-array systems, due to their ability of electronically modifying the ultrasonic beam properties. The inspection of bolts and threaded rods is a clear example of this problem. In this work, the evaluation of brake disc fixation bolt integrity, used at high speed train wheels, is presented. 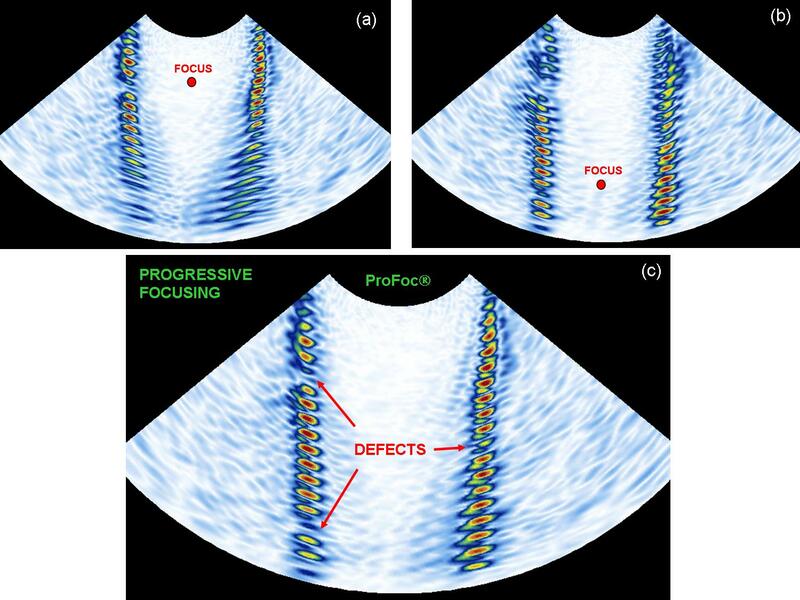 Inspection procedure is detailed, and it is shown how progressive focusing technique (ProFoc®) ensures the best lateral resolution at any inspection depth. 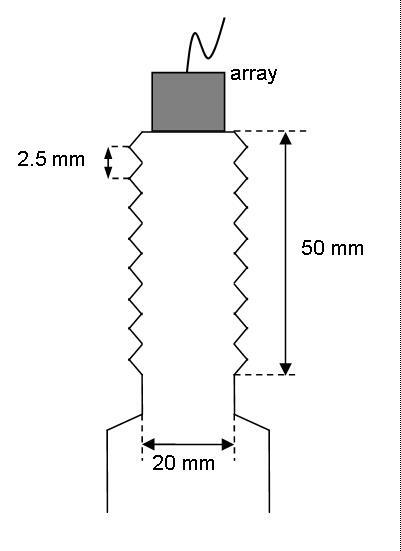 A phased array with 32 elements, inter-element pitch of 0.5mm and 5 MHz was used, in contact with the flat surface of the inspected part (see Figure 1). A SITAU-311 equipment was used, with 32 channels multiplexed to 128 array elements, and angular B-Scans between -50º and 50º were performed. The goal of the inspection is to detect three artificial notches that emulate a broken thread at different depths. Figure 2 shows resultant images with three configurations: (a) fixed focus at 20mm, (b) fixed focus at 40 mm and (c) progressive focusing (ProFoc®). A quite short deep of field (DOF) is obtained when a single focus is applied, which prevents to evaluate the whole component with a single image. Progressing focusing technique overcomes this problem, because it maintains a constant angular resolution at any inspection depth. The echo generated by the thread edge is attenuated when it is damaged, which can be easily detected in the image ( figure 2.c ). Also geometric aberrations and internal cracks could be evaluated with this technique. Electronic scan allows evaluating the whole component with a single array transducer. Moreover, inspection can be carried without un-mounting the brake disk, which greatly simplifies in-service operation. This technique is also appropriate to verify the component integrity during the manufacturing process. Using a rotary inspection head, the whole bolt volume could be evaluated with an angular resolution of 1º in just 15 seconds. This way, component quality can be guaranteed when it leaves the production line. The same inspection principle could be applied to steel rods, billets and pipes, with or without threads. As DOF depends on focus range, and because thread defects can be present at any depth, this component cannot be correctly inspected with a single fixed focus. It was demonstrated that ProFoc® technique, available in all SITAU equipments, obtains the best possible lateral resolution at any depth, which guaranties defects detection at all ranges. Moreover, up to 16.384 focal points per image can be automatically calculated by ScanView® software, and no special configuration parameters are required. Hardware implementation of the focusing algorithm guarantees real time operation at high frame rates.